Package includes: 5 x 14" paper pom pom (orange, lemon yellow, hot pink, blue, green) 5 x 12" paper pom pom (orange, lemon yellow, hot pink, blue, green) 5 x 10" paper pom pom (orange, lemon yellow, hot pink, blue, green) 5 x 8" paper folding fan (orange, lemon yellow, hot pink, blue, green) Product Features: High quality: made of high-quality paper, bright colors, safe and non-toxic. Perfect decoration: products can be used for shops, hotels, house indoor layout, also for weddings, parties, dance celebrations and other decorations. PHow to make paper pom poms: Step 1: you must tie the rope in the middle tight, until the rope doesn't slide. Step 2: open the petals layer by layer to finish one side, then turn the other side to open layer by layer again, then sort out the whole shape. Step 3: you will have a semicircle, and if you want to make a spherical, open some outer layers further to sort out. Step 4: if you want pom poms with more petals, you can tie two semi-circular balls together to form a spherical shape. 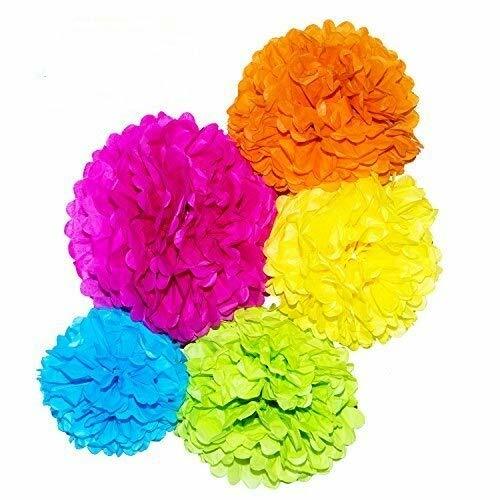 Package includes: 15 paper pom poms and 5 paper folding fans; Product color: orange, lemon yellow, hot pink, blue and green. Product Size: Paper pom poms have 3 different sizes (10 inch, 12 inch, 14 inch), 3 sizes per color. Paper folding fan size is 8 inch in 5 different colors. High-quality materials: made of selected high-quality paper, bright colors, safe and non-toxic. Interior decoration: products can be used for shops, hotel layout, or house interior decoration. Party decor: products can be used for wedding arrangements, decorating birthday party, dance celebrations, as well as various holiday parties. 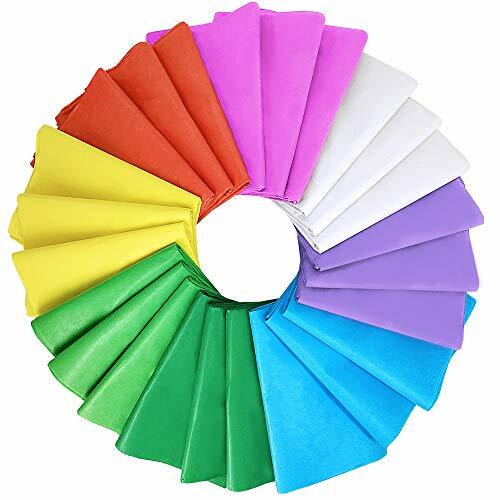 Package includes 160 sheets 8 Easter Day color gift wrapping tissue paper bulk, each color has 20 sheets craft tissue paper. Add a holiday touch with this classic holiday tissue paper assortment for Easter Day. Art tissue paper measure appr. 20 x 27. Perfect size for decorating your love gifts, party gift bags or paper crafts. Pink,Orange,Yellow,Green,Grass-green,Blue,Wisteria,White. Decorative tissue paper comes in a variety of colors allow for unlimited creativity. Tissue Paper. This lightweight tissue paper is easy to tear and cut, making it the perfect material for surfaces such as paper mache and cardboard. Cut it, fold it, glue it and crinkle it, manipulate into whatever you'd like. It's a must-have item for your at-home gift packaging supply! Decorative tissue paper comes in such a great variety of bright colours, making it so versatile and easy. Makes a bright addition to any paper crafting projects. Quantity: Package includes 160 sheets 8 Easter Day color gift wrapping tissue paper bulk, each color has 20 sheets craft tissue paper. Add a holiday touch with this classic holiday tissue paper assortment for Easter Day. Dimensions(inch)(L x W): Art tissue paper measure appr. 20 x 27. Perfect size for decorating your love gifts, party gift bags or paper crafts. 8 assorted colors: Pink,Orange,Yellow,Green,Grass-green,Blue,Wisteria,White. 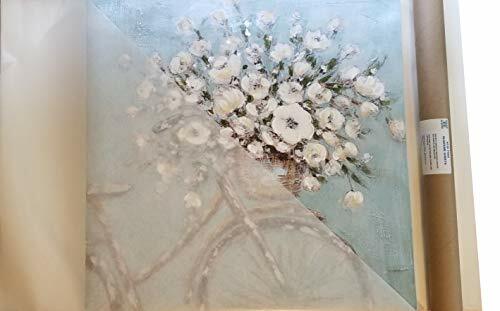 Decorative tissue paper comes in a variety of colors allow for unlimited creativity. Perfect for Easter Day,wedding, engagement, birthday, holiday, baby shower, bridal shower,Anniversaries, Honneymoon Party, or kid's classroom party. Material: Tissue Paper. This lightweight tissue paper is easy to tear and cut, making it the perfect material for surfaces such as paper mache and cardboard. Cut it, fold it, glue it and crinkle it, manipulate into whatever you'd like. It's a must-have item for your at-home gift packaging supply! 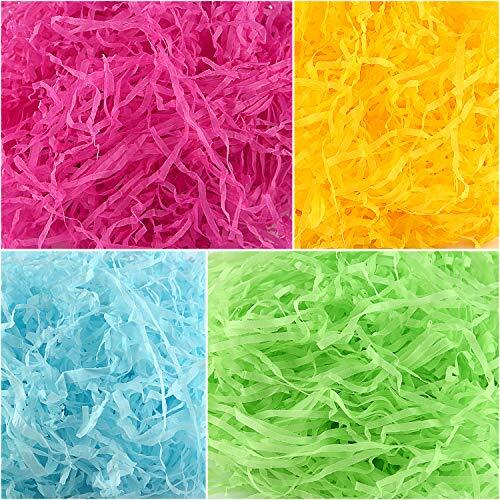 Use colorful craft tissue paper bulk to create a wide variety of crafts like creative gift wrap, art tissue paper garlands and paper flowers, pom pom crafts, designing costumes, making colorful filler for gift baskets or packages, commercial packaging designs, dinner table centerpieces, and holiday or birthday, festival decorations and other unique and fun crafting patterns. Add a special touch to gift wrapping and craft projects. 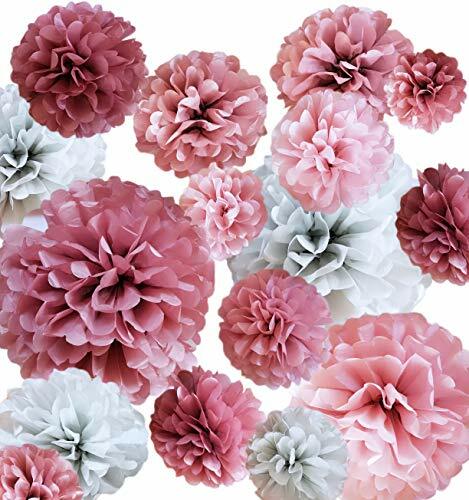 VINANT 20 PCS Tissue Paper Pom Poms - Paper Flower - Party Decoration for Birthday Party - Baby Shower - Bridal Shower - Wedding - Bachelorette - Dusty Rose, Mauve, Blush Pink, Grey - 14 , 10 , 8 , 6"
Tissue paper pom pom decorations are perfect for Mother's Day, birthdays, engagements, weddings, bachelorette party, baby showers for girl, bridal showers or garden part. If you are going to celebrate a special event, you just found the perfect party decoration to create an elegant, festive atmosphere! 8 pcs of Dusty Rose pom poms 4 pcs of Blush Pink pom poms 4 pcs of Mauve pom poms 4 pcs of Grey pom poms The Pom Poms will arrive folded, pre-cut and tied with a satin ribbon ready to hang! Are you ready to add Elegance and Beauty to your party? SATISFACTION GUARANTEE - If for any reason you are not satisfied with our party pom poms decoration - Please contact us so we can make it right for you! No arts and crafts project would be complete without a little pizazz and color! 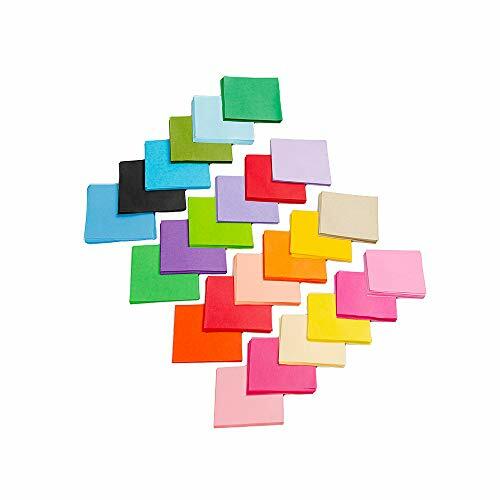 Our Multicolored Tissue Paper Squares can liven up any work of art. They re also good for gift wrappings, class projects, and more. These tissues are safe and won t cause papercuts. They come in a variety of colors, including black, pink, baby blue, purple, yellow, green, red, and tan. Let your work flourish! ARTS AND CRAFTS: No arts and crafts project would be complete without a little pizazz and color! Our Multicolored Tissue Paper Squares can liven up any work of art. Let your work flourish and pop! 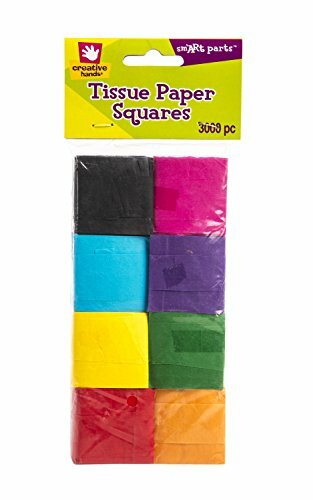 MULTICOLORED: This packs includes black, pink, baby blue, purple, yellow, green, red, and tan colored tissue paper squares. 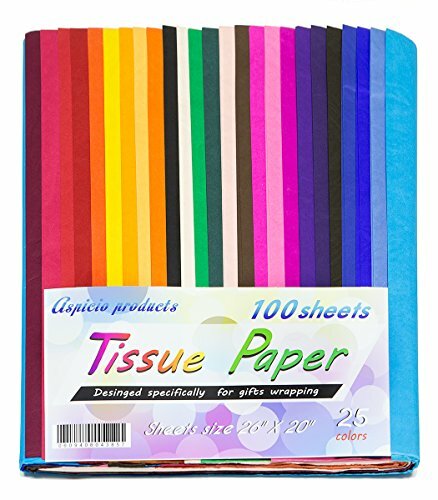 MULTIPURPOSE: Our Multicolored Tissue Paper Squares aren't just great for flashy arts and crafts; they can also be applied to gift wrappings, used in class projects, and more! SAFE, NO HASSLE: A quality arts and crafts undertaking can be stressful enough without the annoyances of paper cuts. Luckily, our tissue paper doesn't cut and is completely safe. SPECIFICATIONS: Package includes 3,000 tissue squares in all. Please note: Product contains small parts. Not for children under 3 years old. Step 1: Unfold the party ball, fanning out the tissue paper. Ensure the ribbon is centered along the length of paper. Step 2: Starting on one side of the pom-pom, separate one sheet of tissue paper and pull it up and towards the center. Repeat with remaining sheets until you have a full pom-pom. Step 3: Finally, you can hang this where you like by the ribbon. Color: showen as picture, pink, orange, yellow. Package: 6 pack a set, each color *2 in one package. Attention: PLEASE DO BE PATIENT ---- THESE TISSUE PAPER FLOWERS ARE DIY CRAFTS. 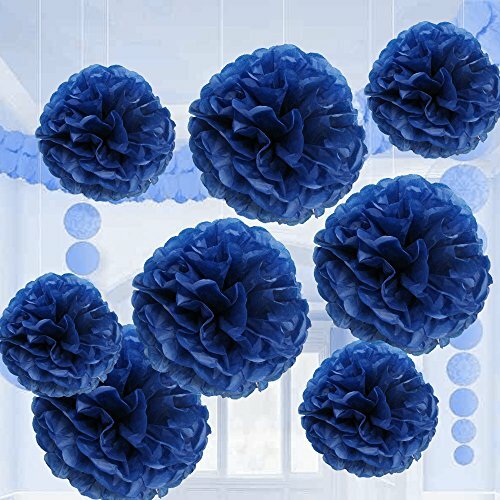 Blue Tissue Paper Flower Pom Pom Balls. 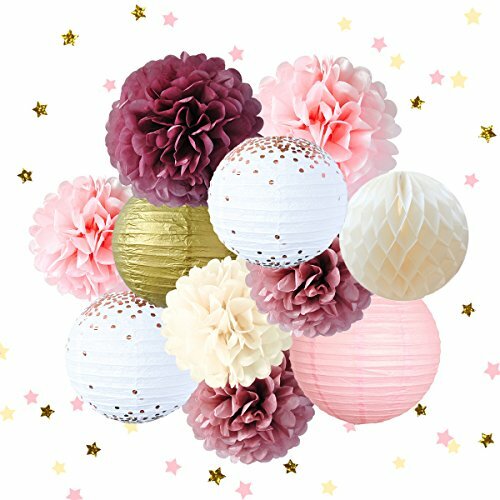 12 and 14 Inch Holiday Party Favor Flower Balls Hanging Decor Party Decoration. 8 Pack. Great DIY Kit For Parties,Birthdays,Weddings,Bridal Showers Etc. PACK INCLUDES: 8 pieces of navy blue tissue paper flower pom pom balls. 4 balls of each size, ( 4x12" and 4x14" ). Each paper ball comes separately packed so you can use as much as you want and the rest you can storage for later use. ASSEMBLY REQUIRED. Tissue paper pom poms come flat packed that are not assembled. Each ball comes with string and step by step instructions how to assemble this hanging party decor flower balls. Handle with care because the paper balls could tangle and tear. Don't rush and don't get frustrated when you work with this tissue paper pom pom balls because it requires your time and work. If you enjoy arts and crafts you will surely enjoy assembling this DIY paper flower ball decoration. 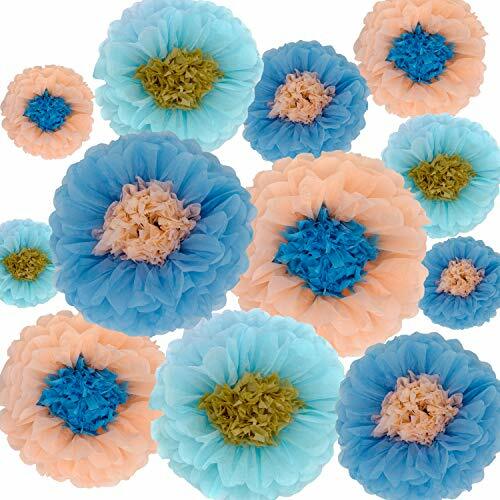 IDEAL FOR: This blue tissue paper flower ball party favor decoration is perfect for parties, birthdays, weddings, bridal showers, baby showers, holidays, anniversaries, gatherings and much more. Hang it from the ceiling or use it as centerpieces and decorations. GREAT ADDITION!! Watch how a flat piece of paper turns into a round fluffy hanging flower ball. Use this tissue paper decoration to add style and class to all of your parties and events. It is a great addition, your party will be a hit with these flower party decor. 100% MONEY BACK GUARANTEE FOR YOUR SATISFACTION!! If you are not completely satisfied with your purchase we will issue a full refund. Premium Disposables is the brand you can TRUST!! Combine with other Premium Disposables tissue paper party decorations. 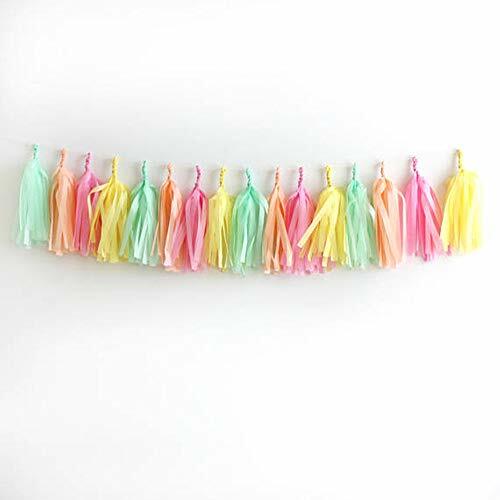 Check out on Amazon more of our different styles and colors tissue paper hanging party decorations by copying the following asins B01NGYZ9C7, B01NCQADOM, B01MY4VCF9, B01MR34ZME. 100% MONEY BACK GUARANTEE FOR YOUR SATISFACTION!! If you are not completely satisfied with your purchase we will issue a full refund. Premium Disposables is the brand you can TRUST!! Combine with other Premium Disposables tissue paper party decorations. 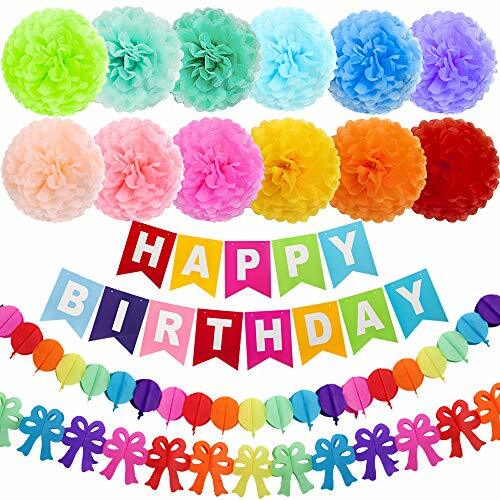 Check out on Amazon more of our different styles and colors tissue paper hanging party decorations by copying the following asins B01NGYZ9C7, B01NCQADOM, B01MY4VCF9, B01MR34ZME. Are You Planning An Unforgettable Birthday Party! All you need is a guest list, snack and drinks, good music and these stunning birthday party decorations for girls and women! Trust us, your guests are going to love the pink, gold and cream decorations, and your party pictures will be very colorful and sparkly! Simple Assemble, Even Simpler Installation! The letter printed flags of our Happy Birthday banner come pre-strung, so all you have to do is mount it at the right spot. As for the pompom flowers and the lanterns, they will be assembled within easily ,take a look at the back of the box for instructions! Don't Throw These Party Decoration Away! After the party is over, simply take the banner, the garlands and the lanterns down and place them back into their beautiful gift box. You can then store them away until your next birthday party! Don't worry, the materials of the party supplies are very durable, so the decorations will remain intact! Our birthday party decoration set is under a 100% satisfaction guarantee, so this is a completely risk free purchase. If for any reason you're unhappy with your birthday party decorations, let us know and we'll make things right. Need we say more? Click "Add to Cart" And Start Planning Your Awesome Part y! COMPLETE BIRTHDAY PARTY D COR KIT : Are you having a birthday party for a kid, a teenage girl or a woman? Then get this 31-piece birthday party decoration kit that will impress your guests and set the right atmosphere! 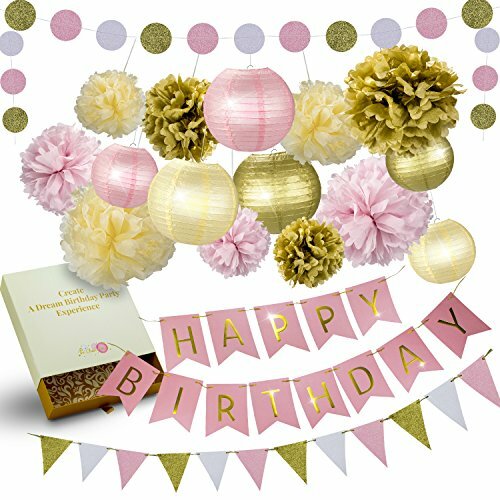 The party d cor set includes a Happy Birthday banner, 9 tissue paper flower pompoms, 6 lanterns, 15 all-glitter triangles in a garland and a glittery polka dot garland. 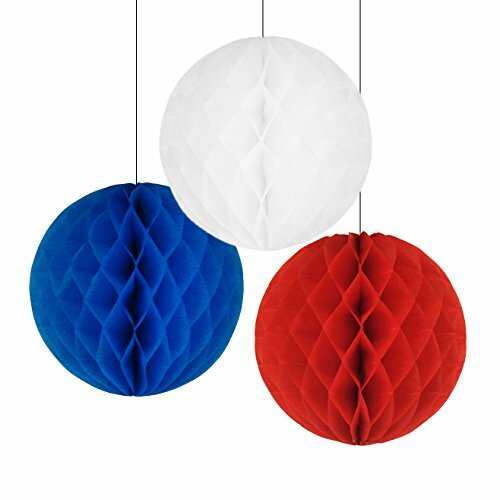 These paper pom poms were made of premium pure wood pulp, light, clear and environmental. 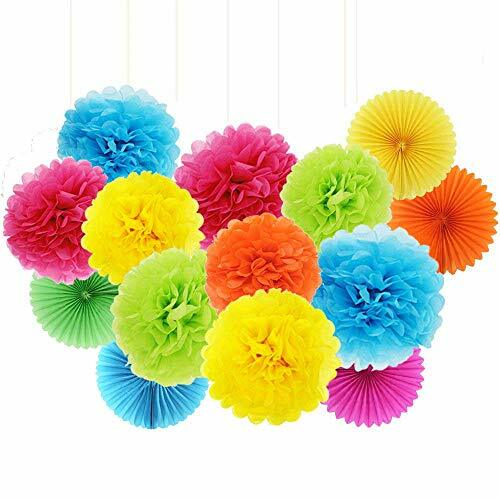 These hanging paper pom-poms flowers are wonderful decorations for festival and party, suitable for Christmas,Independence Day,Labor Day,Veterans Day,Thanksgiving, Valentine's Day,or any other occasion, perfect for fiesta decorations,birthday, wedding, bridal shower, baby shower, kitchen tea, surprise party, job promotion, or any special event. 1.fold these paper flowers in half, tie the accompanying ribbon in the middle. 2.peel the layers of tissue paper apart on each side. 3.fluffing each point to the centre of the ball,make a flower/round fluffy shape. 4.adjust the pom-pom to make it looks full gently. 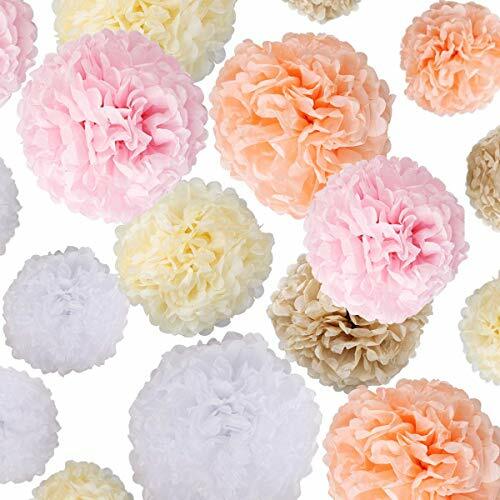 Total 20pcs flower balls, 4 sizes(6",8",10",14"), includes 5 most popular colors. High quality materials, made of premium pure wood pulp, light, clear and environmental. Easy to assemble, follow the instruction, result in a perfect round flower ball. Each one has a white ribbon for easy display and hanging,use them to create a dreamy background for your event. 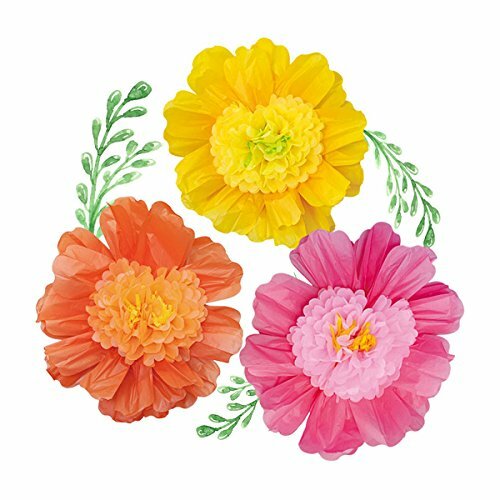 Wide range of uses, these paper flowers can be used for indoor and outdoor events, being the perfect birthday party decoration, baby shower decoration, bridal shower decoration or wedding decoration. Mix it up and add some color and fun to your next party! 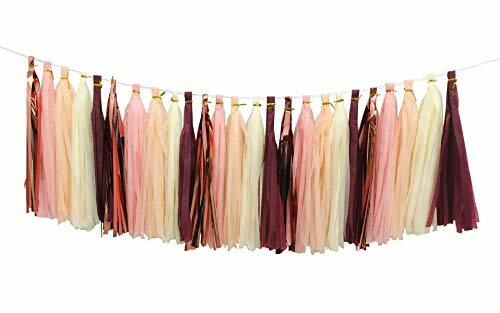 These tassel garlands are great for photoshoot backdrops, birthdays, weddings, bridal showers, baby showers, and more! Comes with 25 tassels per pack of garland. Ships flat and unassembled. *Assembly required. QUALITY & VALUE - Each package comes with 25 tassels per package (more than most competing brands), with each tassel containing 4 layers of plush tissue paper! Tassels are 14 inches long from top to bottom- longer than most garlands in the marketplace! VERSATILE - Each tassel (all colors excluding mylar) contains 5 thin sheets of tissue paper pre-set for you. If you prefer thinner and less plush tassels, you have the option of using 2 tissue sheets per tassel, which makes a whopping 40 tassels! Mylar tassels come with 8-10 stacked together (use 1 or 2 pieces per tassel during assembly). COMPLETE PACKAGE - Everything you need is already included! Includes rope for hanging and 20 pieces of clear tape to hold tassels in shape during assembly. EASY ASSEMBLY REQUIRED - Simply follow our instruction guide on how to assemble the tassels. Once you get the hang of assembling them, they assemble pretty quickly! SATISFACTION GUARANTEE - All our products are backed with a 100% satisfaction guarantee! Crafters of all ages will enjoy these fun cut-out squares. 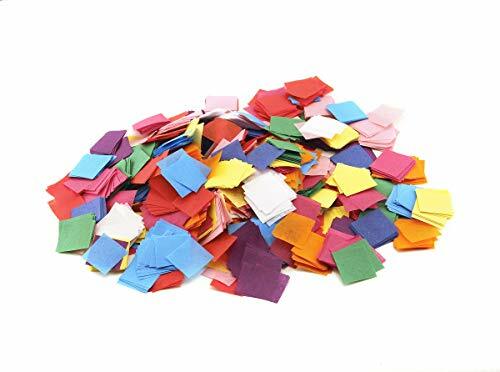 These vibrantly colored mosaic square shapes are made from high quality tissue paper, and are perfect for collages, mosaic crafts and tissue paper crafts. Make collages, mosaic crafts and other crafts projects with ease using our pre-cut tissue paper mosaic squares.